THE GOVERNMENT has announced it will pay back all the money spent last year by the country’s border prefectures – including Samos, Lesvos, Chios, Chania and the Dodecanese – to maintain and operate the detention centres for undocumented migrants and asylum seekers. The prefectures have accrued some 8.5 million euros in debt. The decision was announced by Deputy Interior Minister Theodora Tzakri during a meeting with the prefects in Athens on December 7. Karlas, like the other prefects, is responsible for the maintenance and operation of the detention centres for illegal migrants. He and the other prefects informed Tzakri that the current situation has forced them to shop on credit and run up huge debts with local merchants. The number of migrants sneaking into Greece has skyrocketed in the past few years. Official data compiled by Greece’s interior ministry show more than 146,000 migrants were arrested for entering the country illegally in 2008. This is more than double the number recorded three years ago. The government has repeatedly stressed the need for more EU help. To provide a permanent solution, the Pasok government is planning to transform migrant detention centres into so-called screening centres, where undocumented migrants and asylum seekers will stay for only a few days as their status is being decided. A similar system exists in other European Union countries. This is a major detour in policy pursued by the former New Democracy government, which had announced the creation of dozens of additional migrant detention centres across the country. It had planned to transform dozens of disused military facilities into detention centres and to detain undocumented migrants for as long as a year or until they were deported. However, the conditions at many of the country’s existing migrant detention centres have been harshly criticised by representatives of local and international human rights groups, and the current government itself. During a visit of the overcrowded facility on the island of Lesvos, Spyros Vouyias, the deputy minister for the protection of citizens, condemned the condition of the overcrowded facility on the island of Lesvos and ordered its immediate closure last month. Using language surprisingly harsh for a cabinet member, he told reporters that conditions there were “appalling, inhuman, a violation of basic human rights”. Last week, the government announced plans to overhaul existing asylum legislation in order to increase the number of people who may secure refugee status. Greece currently has the lowest rate of refugee recognition in Europe. According to Michalis Chrysohoidis, the citizen protection minister, it is currently 0.03 percent. Chrysohoidis has also announced that the police will no longer be the sole decision-maker on asylum applications. This will be assigned to a new committee of government officials, legal experts and members of non-governmental organisations. As many as 40,000 asylum applications are currently pending. A senior official of the European Union’s border-monitoring agency Frontex yesterday said the organization’s efforts to curb a wave of illegal immigrants seeking to enter the bloc through Greece would be much more effective if Turkey were to cooperate. Meanwhile, fresh Frontex statistics revealed a 47 percent increase in detentions of illegal immigrants in the Aegean in the first six months of this year, with 14,000 migrants detained on the islands of Lesvos, Samos, Chios and Patmos as compared to 9,500 in the same period of 2008. Statistics for illegal arrivals to Italy and Spain however show a decrease of around 60 percent. Fernandez attributed this dramatic drop partly to the enforcement of repatriation pacts drawn up between Italy and Libya and between Spain and Senegal and to intensified Frontex patrols around the borders of these EU states. Similar patrols along Greece’s land borders have been effective, Fernandez said, stressing that the islands of the Aegean remained a problem area. The Frontex official said this was partly because of the porous nature of the sea border but also partly because of Turkey’s refusal to honor a bilateral repatriation pact. Questioned about reports regarding Frontex aircraft in the eastern Aegean receiving warning signals from Turkish radar while conducting patrols, Fernandez stressed that the interception had been unjustified as the organization’s aircraft had not entered Turkish air space. He added that Frontex has invited Turkey to participate in patrols of the Aegean but has never received a positive answer. Of 11,309 appeals lodged by Greece this year for the return of migrants to Turkey, only 108 were approved, Frontex statistics show […]. Tuesday, 29th of September 2009.
to the Samos island, the situation has not improved at all. In short, we want to share three incidents, which we believe adequately describe the theater of the absurd that is stagede at the expense of these people. Right now in the center at Samos there are at least 500 people. Many of them sleep outside the facility with not even a bed sheet … Many families, many children!The staff is absolutely inadequate and the living conditions deplorable. and blatant indifference of all pertinent authorities? weeks ago. It is well known that minors in accordance with the law should not be considered detainees, so situations such as these defy all legality. Let us finally understand that we are dealing with people and not inanimate ‘packages’. What is the rationale behind this? What can these people, whose only asset is their despair, do? Who would like to have “‘indignant’ citizens on top of the desperate refugees? Let us be side to side with refugees and immigrants and not let anyone turn us against them! There are no illegal lives! According to an “Eleftherotypia” newspaper article, 3.000 refugees are detained in police detentions spaces (in the prison cells of police departments) and 3.000 more in dtetention centers. The detention center conditions, which are even more unbearable due to seasonal heat, could only be described as hellish during August due to the the inhumane overcrowding, which is now the situation at Greece’s mainland detention spaces as well. This has been described as unprecedented, with the facilities with no exception now being 50% over their capacity. Detainees are constantly being transferred from one detention space to the next, but constant “sweep operations” have gradually filled all premises. According to leaks, there are also some “informal” detentions spaces running. The only strategy of the pertinent ministry of interior is actually summary expulsions of refugees to Turkey. The minister and deputy minister of interior are said to be in political rivalry, and their urge to meet with the “message of the euroelections”, the cleansing of Athens and urban centers of immigrants, has clashed with coordination problems and the lack of any realistic plan for “reception centers”, at the expense of refugees’ treatment of course, as described above. The minister is said to follow a plan of constucting four camps until the end of the year, the deputy minister two camps as early as mid September. The situation is believed to worsen by the end of August when the new law which denies refugees to lodge an appeal for rejected asylum applications will be put in effect, opening thus the way for the deportation thus thousands of refugees whose applications are now pending. The Coast Guard of Lesbos Island has been accused of attempting to mass murder 12 Somali asylum seekers, amongst which one woman. According to the case, on the 5th of July an Austrian European border Frontex Helicopter spotted an inflatable boat containing the 12 immigrants off Korakas Cape in Lesbos. Upon the arrival of the Greek Coast Guard, the helicopter left, leaving the Greek cops to arrest the 12. The Coast Guard took the 12 out of their boat, tied their hands to their necks, beat them, and put them back in the inflatable boat before piercing its sides with knives. Then they let the boat go to the open sea telling the asylum seekers in English: “Now you will die!”. Immediately the boat started getting water in, and sinking. The asylum seekers were saved from certain drowning when a British cruise boat passed by, saw them and saved them. The asylum seekers were then taken to Pagani detention camp on Lesbos from where they contacted the UN through a sympathetic lawyer. The Coast Guard adding insult to harm has called the UN law suit against them an act of provocation. In Arta, a town in north-western Greece of 25.000, four Iraqis went on hunger strike on the 9th of July, while another four Albanians are expecting for their asylum requests to be examined. The immigrants are not being accused of any crime, yet they have been locked up in a dirty and crowded cell at the police station for over two weeks, depending only on the good will of the police officers to leave the cell. The Iraqis, considerably weakened by the hunger strike and the conditions of detention, have even abstained from requesting political asylum and are hoping their hunger strike will help accelerate the process leading to their release and administrative deportation. All 23 of the detainees (Somalis and Afghanis) were reported to be suffering contageous diseases, (mainly tuberculosis and scabs) yet were still being kept in jail instead of being taken to a hospital for proper care. The guards refused to go near them for fear of becoming infected and had therefore arranged for the immigrants to have direct access to the toilets. The police officers’ union president added that the immigrants had been offered to be returned to their countries on the expense of the Greek State but they had all declined. A month later, on the 12th of August, four of the immigrants were transferred to the hospital, where they joined another four immigrants-hunger strikers who had been transferred there the previous day. All eight of them are in a critical condition. The original 23 immigrants were still refusing food until the 20th of August, when six of them were transferred to an unknown destination. 17 immigrants are now being detained in Agrinio, accepting water and food and awaiting the State’s decision about their fate. 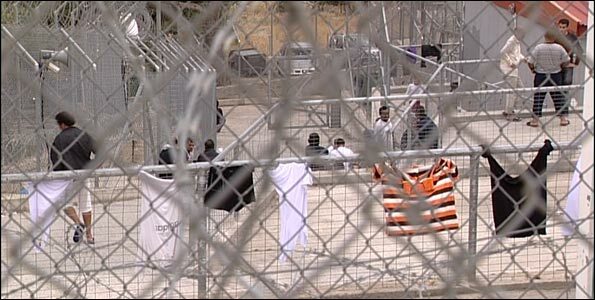 On 18th of August 2009, 160 unaccompanied minors detained in Pagani detention centre went on hunger strike to demand their immediate freedom. All of them are detained in just one room, where they share one toilet, many need to sleep on the floor due to lack of beds. Some of the minors are only eight or nine years old. 50 of them have been detained for over 2 months, the others have been in Pagani for several weeks already. The detention of minors is illegal under greek law. Today, 150 people from a local solidarity movement and antiracist groups here to prepare the noborder camp took to the detention centre to show solidarity and support for their demand for immediate freedom. On arrival, the detained persons started shouting “freedom, freedom”, which was answered by the demonstaration. Messages in English and Farsi were read out as the migrants inside passed letters with their demands and concerning their situation to the outside. All participants of the demonstration were severly shocked in the light of the unbearable conditions in Pagani. We learnt of a 13-year-old boy inside Pagani who was extremely sick and in urgent need of medical attention for two days already. However, none of the authorities responsible acted. It was only when we called an ambulance it was possible to transport the sick boy to the hospital. We also learnt of a heavily pregnant woman in a very bad health state. She however refused to be brought to the hospital since she didn’t want to leave her other two little children alone in Pagani. We left with the promise to come back soon and to spread the information about these obvious human rights abuses worldwide and went to the city to confront the attorney responsible with his neglect in taking care of the minors he is in charge of. We are having hardship times in this worst jail, more than three months in a bad situation, without any supporters except you. The police refuses or rejects to explain our bad situation in this bad jail. We are more than 1.000 prisoners, ladies, guys as well as lots of children. So as a conclusion, please do whatever you can. We are waiting a lot from you, we need our freedom as well as our rights. The recent government policy of moving illegal immigrants to reception centers in northern Greece before expelling them from the country ran into more trouble yesterday, as 580 migrants being held on Samos went on hunger strike to protest the measure. The migrants’ complaints were prompted by an attempt by authorities to remove 26 illegal immigrants from the island on Tuesday so that they could be transferred to another center in northern Greece. Authorities have recently attempted to crack down on illegal immigration by stepping up the number of expulsions, while also taking into custody migrants squatting or renting accommodation in run-down buildings in Athens. The practice of transferring migrants to northern Greece has, in recent weeks, met with the opposition of human rights campaigners who have attempted to prevent the operations from taking place. Yesterday’s protest came as sources revealed to Kathimerini that one in three applications made this year to remain here by the families of migrants living legally in Greece will be rejected. Sources said that some 9,000 applications had been made but that in some 3,000 cases, the requests would be turned down because the migrant who is the main breadwinner in the family was not earning enough money. According to Greek law, for a migrant’s family to be allowed to remain in Greece, the head of the family must declare an income that is 20 percent more than that of an unskilled laborer, which amounts to 10,200 euros per year before taxes. Campaigners for migrants’ rights have expressed concern that since, given the current economic conditions, many immigrants’ incomes do not reach this level, their wives and children will be deemed to be living here illegally. The Interior Ministry said that migrants can appeal any decision to deport their families and instead of a residence permit will be issued with a document confirming their legal status (“veveosi”) that will then be renewed every six months until their case is heard. Two little girls from Afghanistan were among the immigrants detained in the Border Guard Station of Kordelio outside Thessaloniki. 8 year old Narges and 2 year old Farzona were arrested with their parents trying to board on forged documents on a plane to Stuttgart. Although the public prosecutor decided that the family should be trialed in October 2010, the police arrested them and detained the father and the rest of the family in different police prison spaces. In the mean time the police decision for their deportation was issued. Fortunately the next day a court decision ordered their release and their transfer to an NGO managed reception center. Asked about Greek calls for the reopening of the Orthodox Seminary on the island of Halki near Istanbul, Bagis said he backed it in principle but linked it to the thorny issue of the Muslim minority in Thrace. Meanwhile, Turkey’s Culture Minister Ertugrul Gunay indicated, in an interview with the Turkish mass-circulation daily Milliyet, that Ankara was leaning toward reopening the seminary. “Both my personal and the general inclination is that the school will be opened,” Gunay was quoted as saying. While Foreign Minister Dora Bakoyannis and her Turkish counterpart Ahmet Davutoglu yesterday pledged to work together on bilateral issues in their first meeting on the sidelines of an international summit on Corfu, Turkey’s Minister for European Union Affairs revealed, in an interview published in yesterday’s Kathimerini, that Ankara would not be honoring a bilateral repatriation pact with Greece. “We refuse to become the world’s biggest refugee camp,” Egemin Bagis said, noting that bilateral pacts such as the one signed by Athens and Ankara should only be honored if similar pacts are agreed between so-called transit countries for would-be migrants, such as Turkey, and countries of origin, such as Afghanistan and Pakistan. European Commission Vice-president Jacques Barrot, responsible for justice, freedom and security, on Monday paid a visit to reception facilities for illegal immigrants on the eastern Aegean island of Samos, accompanied by Interior Minister Prokopis Pavlopoulos. In statements afterwards, he acknowledged that Greek authorities faced a difficult task but also stressed Greece’s obligation to provide a refuge for immigrants arriving on its shores. “I understand the difficulty facing the Greek government, which finds itself having to deal with an ever increasing number of migrants, as well as the obligation for Community solidarity, but also that there is an obligation on the part of the Greek government to offer refuge to the foreigners that come here,” Barrot said. The Commissioner, upon his arrival on the island, was given a tour of the French vessel belonging to the EU Frontex agency and visited the Migrant Reception Centre on the island, where he talked with immigrants detained there. In statements to reporters, he said that this was a more general problem that cost human lives and required cooperation with non-EU countries of origin or transit in order to be solved. Pavlopoulos declared himself satisfied with what he had seen at the Samos centre and what the Commissioner had witnessed regarding Greece’s efforts to tackle a problem that concerned all of Europe. “It can be understood that Greece is currently receiving the greater number of illegal immigrants. It is making huge efforts to accelerate asylum processes but, as I explained to Mr. Barrot, and as he has himself acknowledged, this does not solve the more general problem that concerns illegal immigrants who are not seeking asylum,” the minister said. According to Pavlopoulos, coping with the economic migrants required solidarity between EU nations. “We must carry out the agreement for migration and asylum, which means signing readmission treaties and putting pressure on countries such as Turkey to honour those agreements that exist. The solution, as Mr. Barrot will explain in Athens on Tuesday, is to look at the root of the problem, and this means that we must stamp out all this illegal trafficking of migrants that exploits human lives,” he stressed. This is a translation of this “Elefhterotypia” article. the Association of Social Workers in Greece-Samos Prefecture Department denounced as Unacceptable the conditions of detention, which do not even guarantee the safety of unaccompanied refugee minors, of passengers and social workers, and complained about hypocrisy in the matter, bureaucratic loopholes and transformation of the social worker into and a prison guard. The Association stressed in the document it directed to all involved actors (political parties, ministries, local authorities, non-governmental organizations), that it finds that the states’ and pertaining services stance towards refugee minors is full of improvisations, hypocrisy and shifting of responsibilities. Unaccompanied refugee minors who come with the slave ships to the islands, says the Association, are transferred to the Foundation «Theomitor» in Lesbos, but they shouldn’t be forced to stay there. The institution is unable to accommodate all the children who arrive daily in the Aegean. Nevertheless, the social worker – Commissioner, designated by the public attorney to accompany 10-20 children in accordance with the law, is accountable to the Greek courts for them, until they reach adulthood, wherever they [the children] may be! «We will not tolerate the transformation of the social worker into , prison guard, security officer and courier of young souls», stressied the social workers of Samos. «We do not agree with the degrading of the institution of commissioning [epitropeia] to excuse the absence of a mechanism of protection for children refugees”. What the association asks is that the wishes of unaccompanied refugee minors, who have crossed on foot half of Asia or half of Africa should be respected. They should be given the opportunity to choose for themselves whether to go or not to the institution or to other support structures, they should be provided with education and training, with the opportunities to learn themselves about their conditions from a lawyer and translator what happens and be transported under conditions that would not risk the safety of themselves nor of the passengers or the commissioners.